Crown moulding is generally seen in many homes as a positive element and enhancement to a room. It continues to be a popular way to finish off the look to spaces in homes that need visual and architectural interest. Crown moulding is one of the first things a person sees in many houses. It provides a custom characteristic to a home, and dresses up the cornices of walls in a home. Now more than ever, people find that the best solution to a home with bare walls is to add crown moulding for a rich transition from wall to ceiling. Blumer & Stanton’s M-205 Poplar Crown Molding complements any room in need of some visual interest. It’s recommended that the Blumer & Stanton’s M-205 Poplar Crown Moulding be used for indoor applications in a room with a ceiling height of 8 feet or higher. 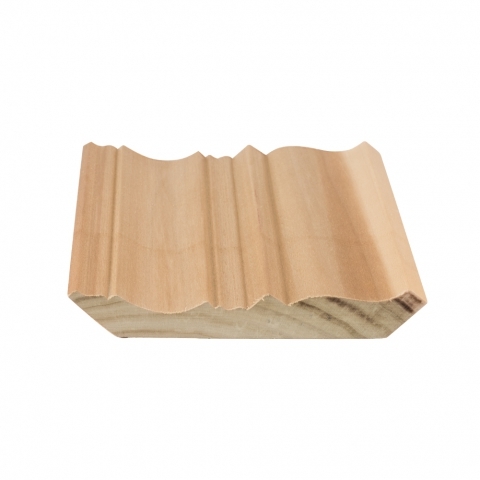 The M-205 Poplar Crown Moulding measures ¾” x 5-1/8”, has a drop of 3 7/8”, and a projection of 3 5/16”. Crown moulding, also widely known as ceiling trim, can easily finish off the look in any bedroom, bathroom, study, or home office. It’s well worth to use crown moulding in a home because if there is only one detail in a room that is wrong, everyone will notice it. Blumer & Stanton’s M-205 Poplar Crown Moulding saves people time and energy, because it avoids the frustration of installing a multi-piece combination moulding. Blumer & Stanton’s M-205 Poplar Crown Moulding is milled from poplar wood which can be easily painted to add visual height in a room. Crown moulding has always been a favorite of many homeowners, because it gives the interior of homes proportion and makes living spaces feel more comfortable. People continue to appreciate how crown moulding can give boring walls some architectural interest and style.